« Christmas ? When did THAT Happen? 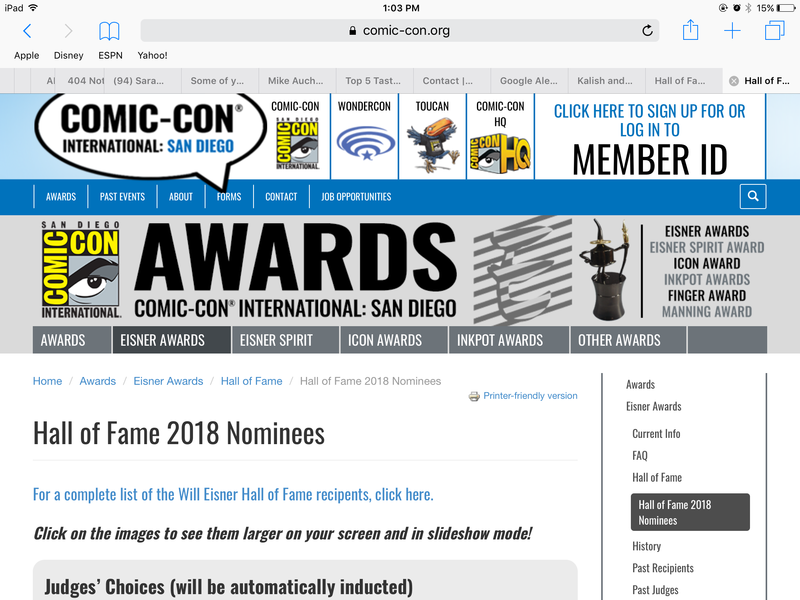 Wilson has been nominated for the Wil Eisner Hall of Fame! 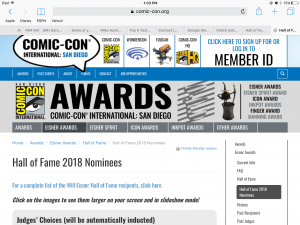 Please go to eisnervote.com and follow the instructions. ( I’m sorry this is NOT a link to it…I’d love to make it easier for you, but I don’t know how.) The list of nominees is very prestigious, and you can vote for four people. Four people will be inducted. Two women were already automatically put through, so congrats to them. Please vote for Wilson, as he deserves this honor. When I told him about it last night, he was positively BEAMING! He really does understand things I tell him, and this brought a smile to his lips, he was so pleased. You must register first, which is really easy. The site leads you right on over to the list, to vote. The voting closes March 16, so do it now lest you forget. Think IDES OF MARCH, which is the 15th. If you don’t vote by then…well….that Ides thing could get you. This entry was posted on Wednesday, January 17th, 2018 at 6:41 pm	and is filed under Uncategorized. You can follow any responses to this entry through the RSS 2.0 feed. You can leave a response, or trackback from your own site.